I suffer from bumpy forehead. I thought, "Why not try an acid peel?" But I had tried acids in the past -- from the wimpy creams and treatments found in Ulta and Sephora to strong, burning peels at the doctor's office. Expensive as they were, they did not seem to work. I had not considered trying acids again until I saw the many positive reviews on makeupalley.com for Makeup Artist's Choice 40% Lactic Acid Peel. After a few months of resisting, I caved and pulled out my credit card, buying another product and hoping for a miracle but in a way still expecting it to fail. It's been 10 days and 4 peels since I started. I'm not saying this is a miracle product yet, but it looks promising. I want to share my progress. As my acne is mild, the changes so far have been subtle. The wrinkles around my mouth seem to be diminishing as well as my bumpiness. The brown spots from past pimples are fading more quickly (ref: the progress around my hairline). Here are my pictures. Now you know why I call myself BigPore. The first one is the BEFORE. The second was taken on Day 10. I'll update with pictures in another 10-14 days. I find it odd that many posters are willing to try any product that is recommended here without proof or pictures. And here I am with DAY 10 pictures documenting my progress without a "You go, girl!" I posted something here about 3 weeks ago and the title in my post was about age, acne, oily, sensitive skin. I remember you, you had extremely similar problems as I, very easily irritated skin especially. I just seen your post and your improvements look great. I'm glad to hear about the lactic acid working for you. I also have the 40% lactic acid peel kit sitting in my cabinet but I am afraid to use because everything I try to use on my face gives me an allergic reaction. I will have to try this soon as I see it works for you. I am still waiting for my face to calm down from the Hyrouquione reaction and that was over a month ago. Now I ended up having a cystic acne breakout. I also have scars (old ones) indented. So here is your "YOU GO GIRL" from me Us older ones (here 42) need to stick together and talk. So...are you doing a 40% peel every other day or so? I am still waiting for my face to calm down from the Hyrouquione reaction and that was over a month ago. I used hydroquinone about 2-3 years ago as part of the Obagi system. It really did a number on my skin. It become red, raw, bleeding, and to add insult to injury, broken out. My skin needed about 3 months to heel from the damage. To sooth it, I wore only aloe vera and prescription strength hydrocortisone. You are very welcome. I am just so glad that you found something that did not irritate your face and made it better. I really can sympathize with you alot about this. I used Paula's Choice Hydroquoine 2% only one time and that did it for me. I am still having trouble cleansing my face. It stings, burns and itches, not to mention I am very red. Now I am having a Cystic Acne Issue......I don't know what to do, I am too scared to do anything. But I still need a cleanser, I have tried about 5 now with no luck, just wasting my $$. Keep up the good work and I am happy for you It's great when something turns out good!!! Retin-A does not seem to help my skin anymore. It actually looks better since I've stopped. I think it's that I used it for nearly two decades. Also, I couldn't use Retin-A while pregnant. Okay, I'm ecstatic. I no longer get bumps on my face. They're gone. The wrinkles on my forehead are smoothing out and my furrowed brow has disappeared. The hyperpigmentation is 75% faded. My skin feels softer, smoother. 1. You can't pick your face. 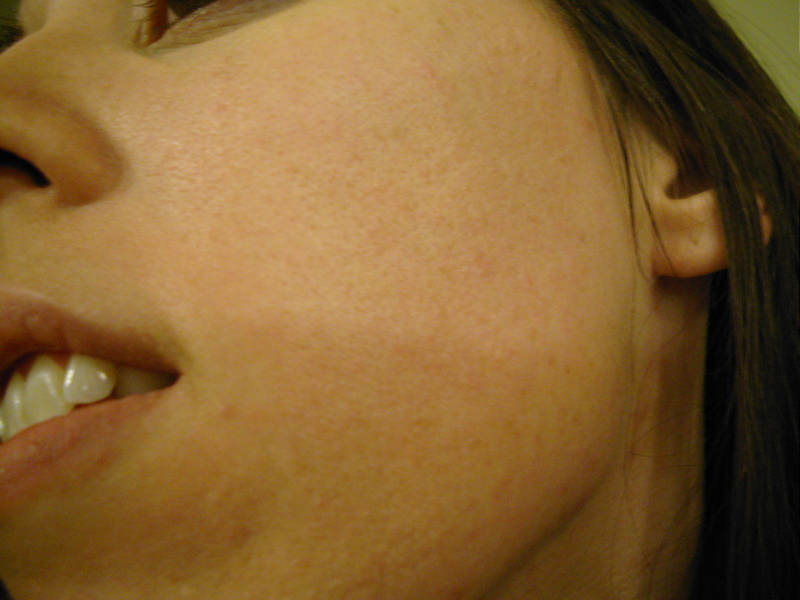 The skin is delicate right after a peel. Any scraping will destroy it. Also, before a peel, you can't pick your face because you aren't supposed to put the acid on irritated or broken skin. If you do, you delay healing time. So. no picking face. 2. Your skin feels really tight for about 24 hours after a peel. Sometimes it flakes, sometimes it doesn't. 3. No harsh exfoliating. No scrubs. Nothing. Only the gentle motions of a nubby washcloth. 4. You need to moisturize. 5. The instructions say to use no more than 1-2 per week. They weren't kidding. You do get the best results with that frequency. 6. This peel dries my small-to-medium size pimples out fast. So glad to see more progress for you!!! Are the Lactic Acid Peels shrinking your pores? My Lactic Acid Peel Kit is still sitting in my cabinet. I do not think I am going to use it, reason because I find that anything that takes off layers of my skin reveal the real damage that is underneath. Proof positive, exfoliating with BHA for 2-3 years turned my mild scarring into moderate scarring. Having acne for 32 years has ruined that layers underneath and exfolating really revealed the damage and brought out a lot of scarring under that I did not realize was there. I see also that you were are 2 courses of accutane. I would like to know more about your courses. You can PM me if you like. I don't have insurance, just Medicaid and I don't think they would pay for any derm visits or treatments. There is so much more to discuss, I know we are in the same age group (or relatively close) and might be dealing with some of the same problems. Oh, one more thing, my regular MD put me on Doxy a little over a week ago. Uggggg..... I really did not want an antibiotic. I sure hope we can talk. Unbelievable! I finally found something that worked for me. You said you'd tried peels before? Had you tried a salicylic acid peel? That's what I'm using now and it is really working for me. I love it. I have recorded my progress in my gallery. Now that my skin is clear I can see a lot of mild scarring so I'll have to do something about that. I'm thinking about doing something like maybe lactic acid. Has it helped your scarring? This is a pic of me today. I have done the salicylic peel 4 times. Oooo! Your skin is looking good. Salicylic acid is better at dissolving oil than other acids. Unfortunately, all salicylic acid products including peels cause some weird allergic reaction for me. My skin is really, really sensitive. Lactic acid works for me. It has helped scarring a little. It got rid of the pigmentation and smoothed things out somewhat, but not that much. I probably need a higher concentration. Thank you Too bad you are allergic. I am allergic to BP. It gives me big red swollen frog eyes. It is really gross. I got my peel from skinlaboratory.com. I noticed they have a lactic acid one too. Looks like things are going along great for ya. If you think your pores are big, you should see mine. One of the best things about doing full peels yourself is that you can do them as often as you like for a fraction of what a dr. or spa charges for them. A suggestion. After you have used the lactic acid for awhile you may want to step up to something a lil strong like glycolic or if your skin is oily try salicylic. Years ago I use to use glycolic acid peels regularly and was very happy with the results. In the past 1.5 weeks I have started using salicylic acid for the first time. It acts fast and took a lil getting used to. After my first peel my face looked like a piece of beef jerky. I said to myself "what have I done". Within about 5 days the acid treated skin shed off and my skin tone ,wrinkles sun/age spots are looking great. My skin looks so much younger already. The salicylic acid peels have done more for my skin in a week and a half then glycolic did in about 6 months. A suggestion. After you have used the lactic acid for awhile you may want to step up to something a lil strong like glycolic or if your skin is oily try salicylic. Thanks. But my skin has terrible reactions to SA. If my skin stops responding to LA, I probably will begin rotating treatments with glycolic acid. I have a reaction to SA too, it's odd..i get dermatitis and big cysts after a week or two of using it. Every dermatologist/esthetician thinks i'm lying so it's good to know i'm not alone I'm going to begin doing 40% lactic acid peels from puredeming once i receive it. my main concern is hyperpigmentation so its good to know that you were able to get rid of yours! can i ask how bad your marks were before you began the peels? You said that the lactic acid helped to smooth things out a little but not very much, were you talking about clogged pores or lines or? i have some clogged pores too that i'd like to get rid of. I think they have higher concentrations of lactic acid that you can try, or you can alternate with glycolic. are you still doing the peels about twice per week? can i ask how bad your marks were before you began the peels? You said that the lactic acid helped to smooth things out a little but not very much, were you talking about clogged pores or lines or? i have some clogged pores too that i'd like to get rid of. LA has helped with smoothing wrinkles, unclogging pores, and fading hyperpigmentation. I get dark marks after pimples go away, and these dark spots can take months to go away. Since I started the peels, I rarely get them. If I do, they take only 1-3 weeks to fade as opposed to 6 months. My blackheads are about 60% fewer. Since the shape and size of my pores causes them to be dirt collectors, I consider this an amazing success. I don't get many whiteheads anymore. What LA has not done for me is smooth the long-time scars and pits from past cysts and from my busy fingers picking my face. I read in a derm's brochure that only strong peels like those with phenol or aggressively "sanding" the scarred areas would take them away. Because of the risks, only a physician (I think) can do them and an anesthetic must be used. I read in a derm's brochure that only strong peels like those with phenol or aggressively "sanding" the scarred areas would take them away. Because of the risks, only a physician (I think) can do them and an anesthetic must be used. Start looking into dermaroller treatment with LED light therapy. There are active discussions going on in the scar section of this board. I ordered the lactic acid 40% from MUAC too, it should be here tomorrow. I read so many great reviews about this product doing a google search. I paid $22 for the sample size. I'm going test spot under my chin.